I very vividly remember sitting at home on a Sunday night in 1996, during my senior year of high school and listening to WNEW while doing homework. At that point WNEW was still a rock station and Sunday nights were one of the few times that a freeform radio show played on a major commercial radio station. Vin Scelsa’s Idiot’s Delight show was a true old-school freeform radio show and always interesting, fun and often exciting to hear. Scelsa hosted an in-studio concert and interview with a young band from North Carolina promoting their first eponymous album on an indie label. 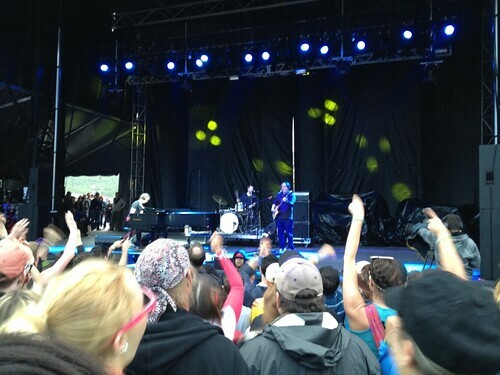 That band was Ben Folds Five. Of all of the artists that I’ve listened to in the course of my musical enjoyment, a very few stand out as ones that I both vividly remember hearing for the first time and continue to enjoy. And that radio appearance completely sold me on Ben Folds Five, because they were doing something unique and uniquely targeted to me: a piano trio playing a mix of pop music with solid melodies combined with a true punk energy and youthful collegiate humor. I still love that first Ben Folds Five album. 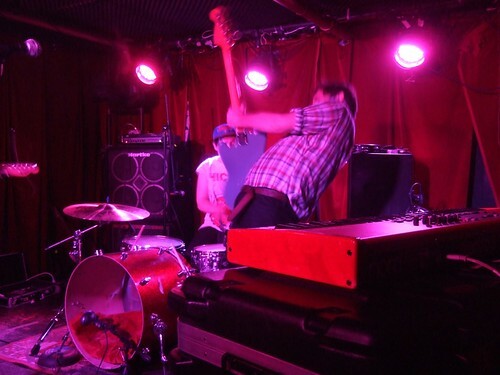 But after “Brick” became a massive hit and after I was underwhelmed by The Unauthorized Biography of Reinhold Messner, they played a fairly low-energy set to headline Spring Fling at Tufts, they dropped off of my radar. And then most people’s radars, since the band broke up in 2000. But when I heard about the band getting together for a reunion earlier this year, I went back into listening to the band, and remembered what it was that I appreciated about their music, and think that it’s still there. The piano pop punk rock works for me. And since their first reunion show would be in Hunter, NY, I decided to brave the hippies at Mountain Jam to see Ben Folds Five again. And it was a great set, in large part because it was a set that was perfectly engineered for a reunion show. No new songs, just the hits and fan favorites. At least, that is the case for me. More than any other artist currently working, Movits makes the kind of music that I want to make. It’s got a unique voice, it’s fun, it’s happy, it’s danceable and it features saxophone. Upright bass is an extra plus. Of course, I probably wouldn’t go with lyrics in Swedish. Aside from some brands (Ikea, Volvo) and proper names (hockey player names and characters from Steig Larsson’s novels), I don’t know a word of Swedish. Yet I couldn’t stop smiling throughout the show. Perhaps that’s a result of a lack of comprehension and perhaps the words are very serious and somber in contrast to the fun and danceable music. 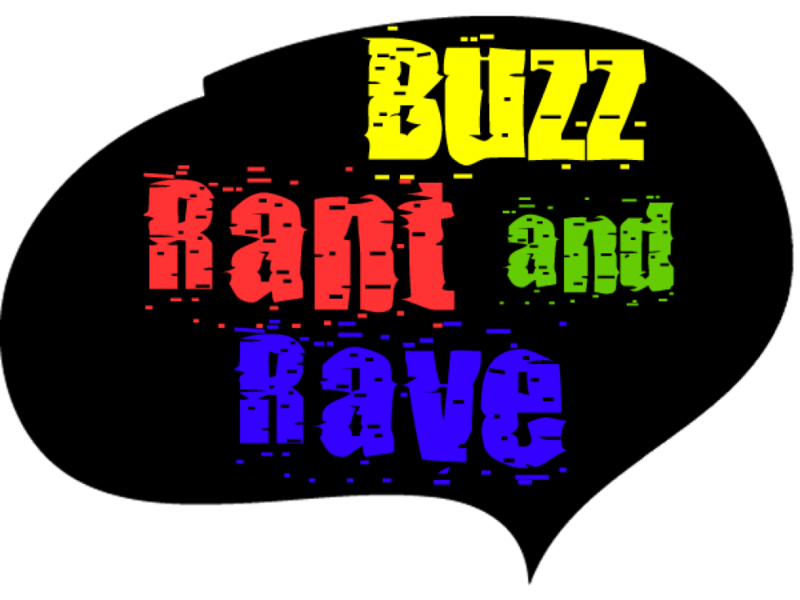 When we at Buzz Rant & Rave World HQ realized that CMJ was coming up again, the response was distinctly unenthusiastic. While it’s great to have the festival atmosphere along with all of the opportunities for afternoon drinking, as a festival, it’s never been the reason for many interesting and unique collaborations or bills that wouldn’t otherwise exist. Generally, the promoters and venues book acts who they would normally host on a typical bill (or would like to.) As we’ve gotten further from college age, the presence of all of the college radio programmers makes us feel old at the festival. And it encourages the annoying music blogger groupthink that’s turned us off from reading too many music blogs. Despite all of these drawbacks, it’s still an important presence in the NYC music scene and perhaps the best indie music festival after SXSW. In years past, we’ve spent more time plotting out a schedule with a detailed timeline to hit as many showcases as possible. Unlike the last couple of years, when we analyzed trends in band names, we barely glanced through the roster this year (see Music Snobbery’s review of some of the weird, strange and usual of this year.) 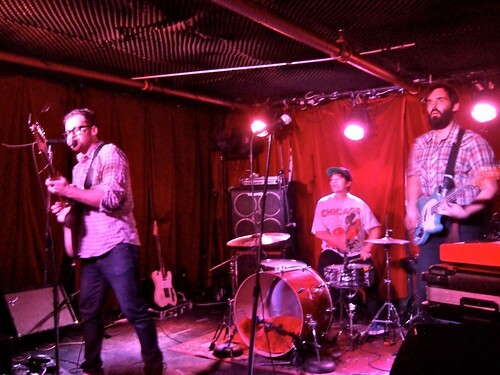 But the CMJ experience this year involved much more random sampling of bands playing in venues we like at convenient times, especially scheduled to fit around other non-CMJ social plans. But we still had the opportunity to catch some highlights. The single best act I saw during the festival was Australia’s Philadelphia Grand Jury. They played a LOT during the week, but I caught them at the I Rock I Roll day party at The Delancey on Saturday afternoon. If Flight of the Conchords self-aware, funny and humble pop music represents New Zealand, Philadelphia Grand Jury (or the Philly J’s) are the embodiment of Flight of the Conchords’ TV show take on Australians: raucous, loud and brash– unchecked id. 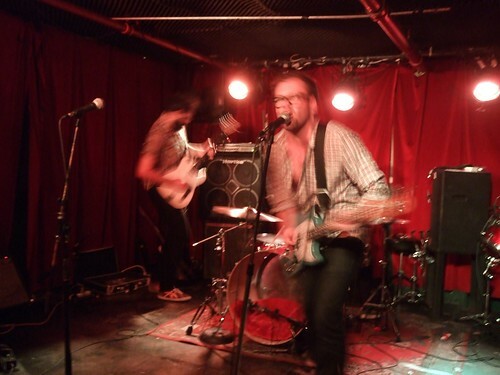 Unlike many of the bands to play NYC in general and CMJ specifically, Philadelphia Grand Jury wasn’t afraid to have fun. They announced every song as “[their] favorite song and the best song.” The band members all jumped out on stage, into the crowd and had fun, despite some issues with the mic stands unable to stand up to the frenzy. They’re a do-not-miss act the next time they’re back in NYC. Earlier that afternoon, Ted Leo played a solo set at Public Assembly. He’s one of the few artists who can play a solo set that’s sufficiently rocking to be fun and engaging. The Brutalist Bricks has grown tremendously on me to become not only one of my favorite Ted Leo albums, but one of my favorites of the year. Catchy, diverse, incisive and rocking. Earlier in the week, just down the block from Public Assembly on North 6th Street in Williamsburg, Screaming Females put on an impressive set at Music Hall of Williamsburg. 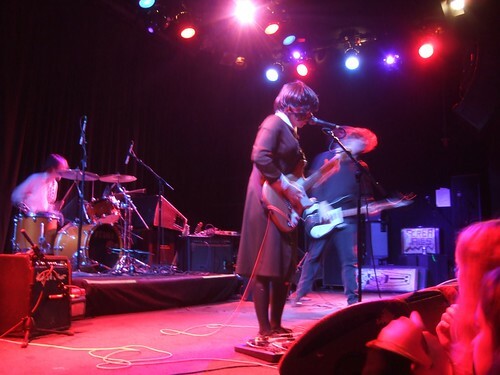 Although the band’s name is both descriptive and misleading: there’s only a single screaming female in Screaming Females, they’re still great. A classic power trio with dynamic and virtuostic guitar playing. Punk rock and lyrical, epic guitar soloing usually exist in opposite corners of the rock and roll universe, but Marissa Paternoster brings it together in a fresh and exciting way. “I hope you’ve got some sleeping bags and tents. This might be a really long show tonight,” says David Bowie from the stage a couple songs into his newly released live disc A Reality Tour. This turns out to be accurate as the show doesn’t conclude for almost thirty more songs encompasing two discs. Pulled from a pair of shows recorded in Dublin back in 2003, there’s little to hint that this turned out to be an ill-fated tour (it was cut short due to Bowie’s health issues, and one show was cancelled after the death of a lighting tech). Bowie sounds energized and in good voice, has a top session band behind him and an energetic crowd (mixed high). Overall, the disc does well in conveying the feeling of being there. To his credit, Bowie picks songs from throughout his catalog, with about half the selections coming from his prime Seventies albums and the rest mostly from his post-Eighties work. In fact, only a few Eighties songs sneak in, and the most well-known only as a bonus track (“China Girl”). The highlights still come with the older material, including a great duet with bassist/vocalist Gail Ann Dorsey on Under Pressure (she kills on the Freddy Mercury vocal), the slow-building, anthemic Heroes and the suberbly sung Fantastic Voyage. Hang Onto Yourself comes late in the set as part of a trio of Ziggy Stardust songs and is the only really rocking moment of the show. The rise in energy (and beats per minute) produce the best crowd reaction of the night. Which is not to say that the discs aren’t a good listen. Bowie didn’t have much to prove on this tour, and really just needed to give a good show, which he does with good cheer and occassionally excellent performances from him and the band. In the end, A Reality Tour is a meant more for his fans than as a way to convert non-believers, and as a token of the tour, it does an admirable job. Now that I’ve ripped all of my CD’s into compressed digital formats in iTunes, I’ve acquired a turntable and started listening to more music on vinyl. As a listener, it’s nice to have a more active and physical connection with music. Hard disk-based libraries are wonderful for depth and variety, but for listening to the great albums that you love as albums, the album-centric listening experience is rewarding and engaging. Instead of building a multi-hour playlist of digital music spanning dozens of genres, artists and albums across hundreds of songs, an LP listener has to flip after each side and can’t easily skip ahead from song to song. The medium forces more engaged listening. But the LP is also an inferior medium to the CD and even compressed digital formats. The CD has tremendously more dynamic range. Dynamic range is the amount of sounds that can be reproduced from a recording– from the lowest note and softest volume to the highest frequency and loudest volume. Music recorded earlier than the mid-1980s was not only mixed, mastered and produced to fit within the limits of the medium, but also recorded to sound best on the medium. While 2″ analog tape has a much wider dynamic range than an LP, did any artists not seek to make the best sounding LP possible? Comparing the waverforms for the CD and LP versions of Bob Dylan’s Eyolf Østrem looked at the amount of dynamic range used by the different masters of the same album and concluded, Someone Please Fire Jack Frost. Even though the CD is capable of delivering a more dynamic representation of the music, it’s often end up delivering as loud of a delivery as possible with less dynamic range. Given that digital formats are using less dynamic range than LP’s, and that analog distortion is warmer, more musical and more natural than digital clipping, the vinyl record is remaining relevant, because the inferior medium is used in a superior manner. The loudness wars are making modern digital recordings sound worse than records. Which is a shame, because properly recorded and mastered digital recordings are more dynamic. The deepest lows and highest highs that a CD can reproduce are higher and lower than those on vinyl, but for albums that don’t use all of that dynamic range, the warm sound and focused experience of listening to albums is more compelling for music fans. But sometimes when a band is just setting up, you get a feeling that you’re going to like them. If they’ve set up a four piece Gretsch drum set, Rickenbacker bass, Telecaster guitar through a Fender amp, baritone sax, tenor sax and trumpet, you get a sense of the sound they’re going to have. Combine with a British flag and before the band is even on stage, that’s a pretty solid indicator of the kind of sound they’re going to have. Borrow the Dap Kings horn section and execute well and there you go: a recipe for awesome. Some of the collaborations made up for the extraneous or boring ones. Half of Stevie’s guests were teh awesome. Jeff Beck came on stage to wail on the guitar for “Superstition.” And it was tremendous. John Legend sang a competent version of Marvin Gaye’s “Mercy Mercy Me” with Stevie. (That’s a case where a competent version is a tremendous complement. Not an easy song to pull off, and while it didn’t reach any higher ground, the song worked.) Legend also sat in on piano with Stevie to cover Michael Jackson’s “The Way You Make Me Feel” for an emotional performance. Aside from an opening trip to “Woodstock,” the Crosby, Stills and Nash set felt lightweight and superfluous to the rest of the night. All three were in fine form vocally, but I could have used another hour of Stevie and Jeff Beck jamming. Springsteen’s choices of guests revealed much about his influences. Sam Moore showed how much of an influence he had on Springsteen as a performer and frontman. It also demonstrated that (with some extra horns) the E Street Band make for a solid soul revue show band. John Fogerty and Tom Morello showed a bit of the continuity of politically oriented rock music. By far, the highlights of Springsteen’s set were the songs that Morello sat in for. I’m not a huge fan of Rage Against the Machine, so I had no expectations for Morello’s playing (unlike, say, Jeff Beck.) His blistering solo on “The Ghost of Tom Joad” brought the song to a new level and helped elevate a cover of “London Calling” from acceptable to great. The interesting contrast between the two is where they took their music after their initial success. Springsteen became an outspoken advocate for the working class through song as stagflation gave way to Reaganomics. He delved deeper into the folk tradition with Nebraska and The Seeger Sessions. He released one of the most relevant and timely albums of this decade with “The Rising” and has continued to write new music. In contrast, Joel evolved from singing about disaffected teens to singing about disaffected middle age adults. His music remained personal, while Springsteen’s evolved to add activism and politics to the personal. Joel may have said everything he has Perhaps that’s why Joel last released an album of new rock music in 1993, Springsteen has released 6 new albums (3 with the E Street Band and 3 folk albums). This is now an annual tradition! For the second year in a row, we’re going to look through the big list of bands coming into town this week for the CMJ Music Marathon and see if we can divine any trends in band naming. Republic is by far the most favored form of government and the Senate is the preferred representative body by this year’s crop of bands. Surprisingly, no fans of direct democracy in the bunch. See also Ear Farm’s CMJ preview, which provides recommendations and information about silly little details like time and location. Last night, I caught Them Crooked Vultures’ debut NYC performance at Roseland Ballroom. Prior to the show, I had not heard more than a 30 second clip of any of their music. But a few factors convinced me to buy tickets for the show. The rhythm section comes from two of the greatest rock bands of all time (Led Zeppelin and Nirvana) and the guitarist/lead singer from a band that I appreciate and enjoy (Queens of the Stone Age). 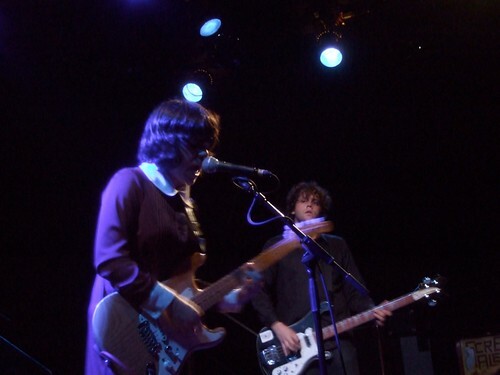 Aside from hearing a single, I went to The Raconteurs first appearance in New York with no more information than knowing the prior work of Jack White and Brendan Benson, and caught a great show. But I was only appropriately whelmed by Them Crooked Vultures. I suspect that the venue and familiarity kept this show from reaching the next level. Roseland is a pretty terrible place to see a concert. The sound is muddy and booming in the cavernous room. Any precise and dynamic bass playing just gets lost in the mud of Roseland’s acoustics. Fortunately, John Paul Jones plays with a fairly distinctive sound that helps emphasize the attack at the beginning of each note. The sightlines from the floor are atrocious. There’s not enough traffic flow for the capacity this room can handle to make entering and exiting easy or quick. New York’s other venues of similar capacity, including Hammerstein Ballroom, Webster Hall, Terminal 5, also present similar compromises to concertgoers, with boomy sound, crowded feeling at capacity, poor sight lines and insufficent bar staff to handle peak rush without queues. Which leads me to propose the hypothesis that there is an inverse relationship between a venue’s quality of experience for performers as for audience. At a large hall like Roseland or Hammerstein, the artist has a proper dressing room, large stage, a dedicated sound engineer for the monitor mix, and space for a big lighting rig. But the audience has to deal with the hassles. 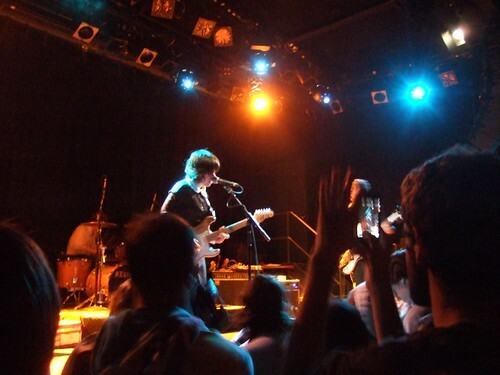 At a small club with capacity of up to a couple of hundred, bands may lack a dressing room, someone to run lights, inadequate monitors and have to deal with the hassles of loading gear on and off stage through the crowd rather than directly back to a dedicated back-stage location, but the audience benefits from good sight lines and decent sound. The larger the artist is of a draw, the more the artist needs to be pampered and the audience will be willing to put up with more hassles. 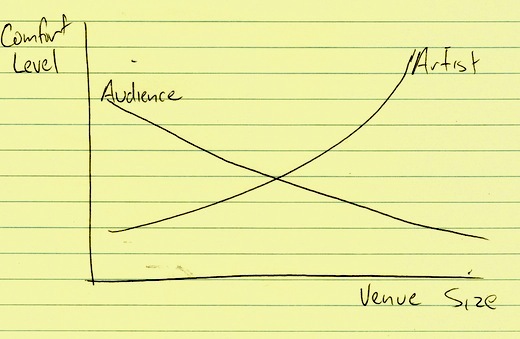 The smaller the artist, the more the audience needs to be made comfortable. There’s a certain level of familiarity with a piece of music that makes it more enjoyable for a listener. The brain needs to do some amount of work to process music at first that listening to a song that one’s heard before is a very different experience from listening to a new song. Stravinsky’s Rite of Spring was so different and difficult, that the audience rioted at the piece’s debut. Seriously, they rioted. And I can think of a couple of concerts I’ve seen the familiarity phenomenon in full effect. At the Raconteurs first show at Irving Plaza, The audience became significantly more engaged once the Raconteurs played the one single they had released to date, “Steady as She Goes.” When U2 played a free concert in Empire-Fulton Ferry Park in 2004, the first 7 songs of the set were all songs from their new, yet-to-be-released album. It was very obvious to see who downloaded the album in advance from the internet and who hadn’t. But the energy level of the crowded raised dramatically when the band broke into older singles, “Beautiful Day” and “I Will Follow.” The audience was much more engaged and energized by hearing familiar material that U2 played the new single, Vertigo, again to feed off that energy to get a better performance for the film crew. The first few songs of Them Crooked Vultures’ set were all huge, riff-heavy energetic tracks that, as expected, combined the bombast of Nirvana with Zeppelin’s grounding and Queens of the Stone Age sludgy grit. The last song featured an epic and heavy jam. But neither the songs themselves nor Homme’s singing helped make the performance more than the sum if its parts. The biggest influence on the group’s sound was Queens of the Stone Age. Which isn’t necessarily a bad thing– unlike some other groups assembled from members of other well-known groups, the parts here add up to something good and coherent. But it also lacked Nirvana’s skill for songwriting and Zeppelin’s heft and showmanship. As expected, Grohl is a formidable drummer. But you also see just how Jones’ style works with Grohl’s to give the rhythm section a taste of Zeppelin, but not attempting to mimic or ape the Jones/Bonham sound. NPR’s Bob Boilen was very enthused with the band’s show at the 9:30 Club, “It’s been a while since I’ve been to a show that I’d call ‘balls to the wall,’ but Them Crooked Vultures aren’t holding back. From their first song, ‘Elephant,’ to the song playing right now, called ‘Highway 1,’ nuance has left the building. Granted, I’m only four songs into the show, but good lord, this rocks.” I suspect that at a club the size of the 9:30 Club as opposed to Roseland, the room didn’t swallow up much of the show’s appeal, which helped the audience enjoy the show that much more. Don’t get me wrong: this was a very good show. Unfortunately, with a couple of tweaks, it could have been an epic show. As a jazz fan, I always love going to the Village Vanguard. Sitting in the club, you can feel the room’s connection with Miles, Coltrane, Sonny, Evans, Dolphy and all of the jazz past, present and future. The club’s pedigree elevates the level of performances on its stage. And so when I got invited to see Barbra Streisand there, how could I refuse? Playing to a jam-packed house filled with contest winners, Streisand’s family and friends (including President Clinton and Secretary of State Hilary Clinton), and film crew (and their lighting equipment), the show was as much an intimate gathering of friends as it was a film session as it was a concert. Streisand performed a mix of standards, tracks from her new album and her signature hits. Once the show started, however, from one perspective, we were taken out of the immediacy and intimacy of the show. Sitting on the side of the room towards the front, the view of pianist Tamir Hendelman was blocked, but the view of Streisand’s teleprompter was clear. So we could read the script that Streisand followed. To one extent, this took away from any sense that the set was a loose, improvised and breezy little set in front of a group of friends, but was a reminder of the major film production part of the hybrid nature of the evening. On the other hand, having a sense of that a good deal of the banter was scripted gives one a tremendous appreciation of why Streisand is in such high regard as a performer, because you could see how much meaning she puts into every phrase. And though the teleprompter cues were used more as reminders of the points she wanted to discuss rather than a script, Streisand’s voice is so expressive that she could (as the trope goes) read the phone book and make it engaging, dynamic and interesting. Whether Streisand’s performance is impeccably rehearsed or spontaneously improvised, I doubt you could tell the difference, because her dynamics are so precise and expressive. Unlike most broadway-style performers, nothing about Streisand’s performance felt artificial or calculated. It all felt natural, heartfelt and authentic. And it’s not to say that the show was perfected to within an inch of its life. There was enough of a rough edge to the set that Streisand walked off stage to close the set one song earlier than she intended. As a result, the audience got an encore twice as long as intended. The backing quartet, led by pianist Hendelman, was impeccable, but also unobtrusive and rarely featured. Hendelman played one well constructed and melodic solo and tasteful segues and vamps between songs. But for a album intended to be more of a jazz album at the country’s premier jazz club, there was no swing to the set until the final encore, “The Way We Were,” where the drummer switched to sticks from brushes for the first time in the set and the guitarist added interesting and tasteful soaring lines.